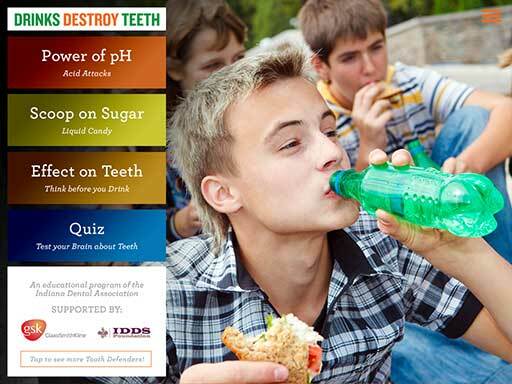 Our brand new Drinks Destroy Teeth mobile app is a great complement to our hands on curriculum. Learn how drinks affect teeth. Come and explore the fun interactive lessons on acid and sugar in popular drinks. Discover how these drinks damage teeth. Videos highlight how acid in soft drinks, sports drinks and energy drinks potentially alter tooth enamel and illustrate just how much sugar is in one soda for a day, week, month and year. Great for the classroom, dental office, or at home. Use as stand alone game, in the classroom, or as a supplement to the FREE Drinks Destroy Teeth curriculum. 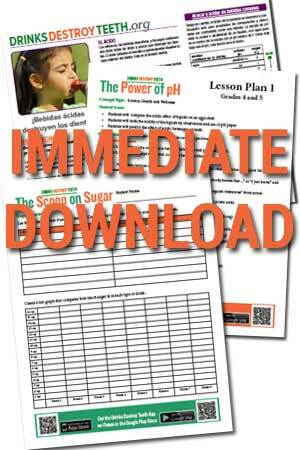 This easy to use lesson plan meets Indiana and CC standards for elementary and middle schools. Preventive oral health, wellness and nutrition benefits all ages in medical and dental settings. What do sugar and acid drinks do to your teeth? The 3D mouth shows changes caused by acid and sugar. Learn the difference between decay, plaque, acid erosion, and more! How much sugar is in your favorite drink? In the Scoop on Sugar Lab, pour teaspoons of sugar into each drink bottle to see if you can guess the correct amount. The results may surprise you! What is pH and what strengths of acid are in different drinks? This introduces the concept of acid and the pH scale. Measure and graph the pH levels in sports, soft and energy drinks, as well as milk and water. The exciting Power of pH video explores the scientific properties of acid by actually pouring hydrochloric acid into a Coke and Pepsi can. The easy science experiment on teacher resources compliment this App. It is suggested the class do the hands on experiment first. The first experiment inquires about the effect of acid in drinks on egg shells (teeth). In the second experiment students measure actual teaspoons of sugar into empty plastic drink containers by following the free acidity brochure lists of pH and sugar of popular drinks. The Scoop on Sugar lab in the App in an option for the second experiment. This lesson meets Indiana curriculum and CC standards on science, vocabulary, math and wellness for elementary and middle school. New vocabulary words link to an illustrated glossary. A five-question quiz reinforces the effect of acid and sugar on teeth. Dentists, dental hygienists, physicians and nurses, as well as, parents find this fun and informative App helpful. It shows how much acid and sugar are in sports drinks, soft drinks and energy drinks and the potential harm the combination does to teeth. The 3D mouth depicts healthy teeth, plaque, white spot lesions, acid erosion and decay. This is a perfect educational tool for those in orthodontic treatment, for athletes of all levels and consumers of drinks. Yes Everyone! It enlightens in an entertaining manner and is visually memorable.